Because my boss is a very kind man, I am currently afforded the favor of working from out on my porch. I mean that, and the fact that the office isn’t open yet. But mostly because he let’s me not turn into a Ritz-sicle while freezing in front of the computer. In said meeting, Jefe and I discussed my successor, a person he’s yet to hire (as in, we don’t know who it will be) but I’m going to call this person a she because it helps my brain stay on track while writing, mmmmkay? mmkay. Here’s a funny picture. the pile of computers in the corner will be used soon. And yes that is a bathrobe BECAUSE IT IS COLD. Kristen has a blanket, see? 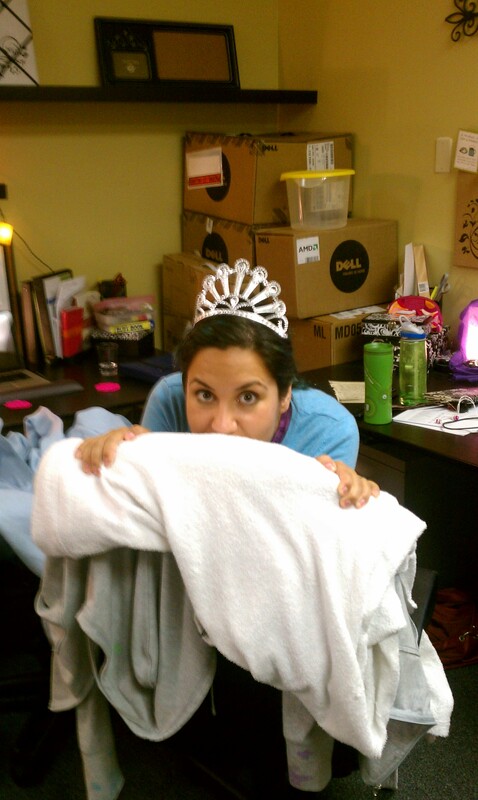 the tiara i cannot explain. I’m praying for the girl who comes after me. Her work week will, by necessity, be shorter than mine, so i’m actively delegating and shoring up edges to streamline anything I can. I have started making a notebook with everything I know that she may wonder or need to know. I have a plan to connect her with the pastors/parents/workers she’ll need to know rather than just know of in order to succeed (and to do it without pulling her hairs out). In short, I’ve got a plan to help her succeed. number one: That she will be better at this job than I am. I wanna lay this down y’all. I have, only by God’s grace, been faithful with this job. I have done well to grow it in every way I could. I’ve been able to love on kids, leaders, and parents well. I’m just asking that God help her be even better. That the ministry be MORE effective, safer, more of a blessing, etc. That she won’t get here and stumble into place, that his grace will assure she’ll soar in success. Did I just write the inscription to a Thomas Kinkade photo? Uhmmoveon. That she will be connected with the kids and parents in an intimate way supernaturally fast. She won’t have the two years I had being in their lives before scheduling their childcare. God will have to bridge the gap. God is always big enough to bridge the gap. That she won’t turn into an intern-sicle. Ya know. From the cold. That fundraising will be a blessing, and provide enough that she can faithfully pour her heart into the tasks and lessons of the internship program. That the KidStuff team will continue as a family, and that she will know and feel that love. That she’ll find a place in the office. That she will be able to impart wisdom and grace with the workers she supervises and leave parents feeling secure while their little ones are in KidStuff. But mostly, yeah, that she’ll be better than me. Fellow intern. 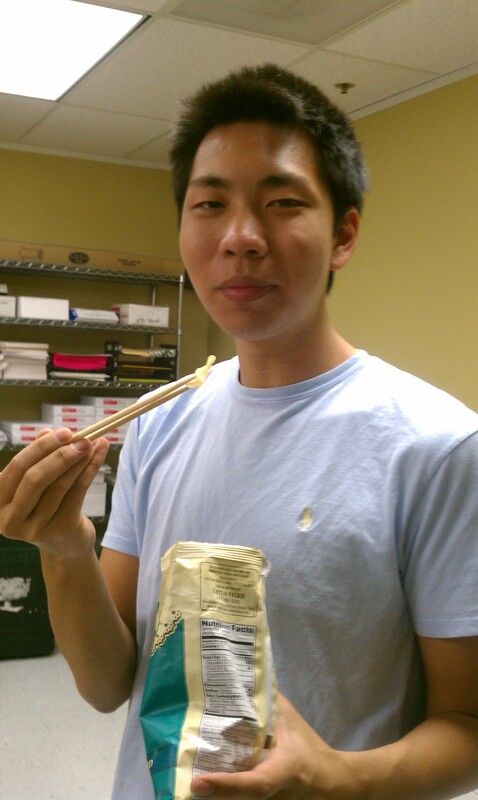 Eating chips w chopsticks. See? She (my replacement) should have fun here!